Readers with an avid interest in the local heritage of Newark cannot fail to notice a series of plaques that are continuously being erected at strategic points around the town as memorials of achievements by individuals, these being worthy accreditations to the cultural or social development of this landmark . 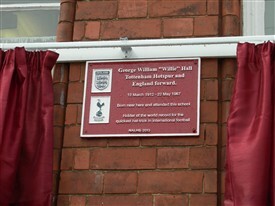 This latest plaque was unveiled by the town's mayor, Councillor Bryan Richardson, on the sunny afternoon of Tuesday 23rd July 2013, and is now displayed proudly in the playground of Lovers' Lane Primary School.1 It was here that the subject began both his formal education and his footballing career. George William Hall was born in a humble home at 12 Tenter Buildings; this has now been demolished in favour of more modern housing. Following his brothers, all gifted sportsmen, he achieved early success for the school team in the Town Championship. 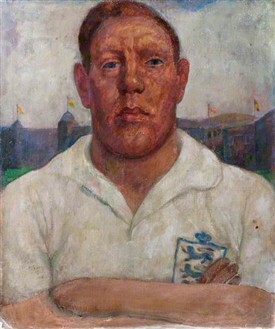 Capped in 1925–26, he went on to represent Newark in the English Schools Shield during that season. Willie proceeded to play for the Y.M.C.A. as a senior; then for Ransome & Marles Bearings Company, his first employer. (The firm, now N.S.K. Bearings and Japanese-managed, continues to field local teams of all qualifying ages under the former name of R.H.P.) By 1930, Willie began his professional career, selected by Notts. County. From their Reserves, he progressed to the first team, and his talents received the attention of The Newark Advertiser. This led to his transfer to Tottenham Hotspur during December 1932, defeating his former club in a league match. From thence, his dream to play for England was realized in the following year. Willie played for England on eleven occasions, opposing France (twice), Ireland and Czechoslovakia initially. Recalled in 1937 following injury, the famous footballing name of Stanley Matthews became twinned with his during a second match against Ireland. 1939 saw games against Scotland, Italy and Yugoslavia. His famous 'hat trick' (still unbeaten) was achieved in the game with Northern Ireland, when he scored all five goals. 2 The game in question, played on 23rd October 1937 and played at Old Trafford has never yet been beaten. The outbreak of War could have interrupted his playing-career, but, rejected for military service owing to medical shortcomings, he served with the Police Reserve. England matches being restricted largely to the mainland owing to wartime embargoes, he played three matches against Wales and captained the Tottenham team before the overthrow of Nazism in 1945. But that which Adolf Hitler could not suppress fell victim to thrombosis later that year. The enforced amputation of both legs brought an end to active footballing. Equipped with artificial limbs, which he rapidly learnt to use, Willie bravely turned to gentler sports and coaching, living then in London, and working successively as a sports outfitter and pub landlord. 1952 brought further dejection by the serious illness of his wife of six years, a victim of tuberculosis, although she made a good recovery. Willie's fame was enhanced on 16th February 1959, when he was chosen as the subject of This is your life by B.B.C. Television host Eammon Andrews.3 But, no longer a man of such stamina, Willie spent more time with his sister back in Newark, excercizing new skills in fishing, and nostalgic sharing with old friends. Here, on 20th May 1967, having watched Tottenham beat Chelsea 2:1 in the F.A. Cup, Willie died of a heart attack. On 26th May 1967, his thanksgiving service at St Mary Magdalene Church was followed by cremation, and the ashes later interred at Newark Cemetery. Tribute has been paid, locally to a man of great bravery and talent, not just in the N.A.L.H.S. plaque, but also in the Willie Hall Cup, presented annually to the winners of the Newark Sunday Alliance. 2006 brought his installation within the Tottenham Hotspur Hall of Fame. © Roger Peacock for NALHS: 17 th August 2013. Referenced source of information: material © Mick Gill: June 2013, presented at the unveiling of the NALHS plaque. 1 Photographed images are by courtesy of Jill Campbell. 2 After this, Stanley Matthews said: ‘Willie was full of emotion back in the dressing room, and cried unashamedly as each of his team mates in turn congratulated him on his outstanding performance and his England goal scoring match record. He was the most unassuming of men, modest to a fault. His unselfish play and great contribution to a game was never truly appreciated by the sports writers of the day’. 3 ‘A football genius and true gentleman: he won his own battles and helped other people to win theirs’: E. Andrews, 1959. This page was added by ROGER PEACOCK on 04/09/2013.